Once cooked, tip into a large mixing bowl and stir in 145g bag Waitrose Watercress, Roquette & Spinach Salad and 270g pack Waitrose Hot Smoked Mackerel Fillets, flaked. Cut a cucumber in half lengthways, remove the seeds with a teaspoon, then thinly slice it. Stir the sliced cucumber into the mixture with a pack of salad onions, chopped. Season and serve with lemon or lime wedges. 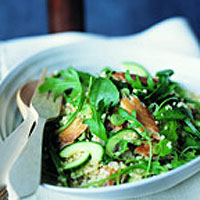 This recipe was first published in Fri Sep 01 01:00:00 BST 2006.